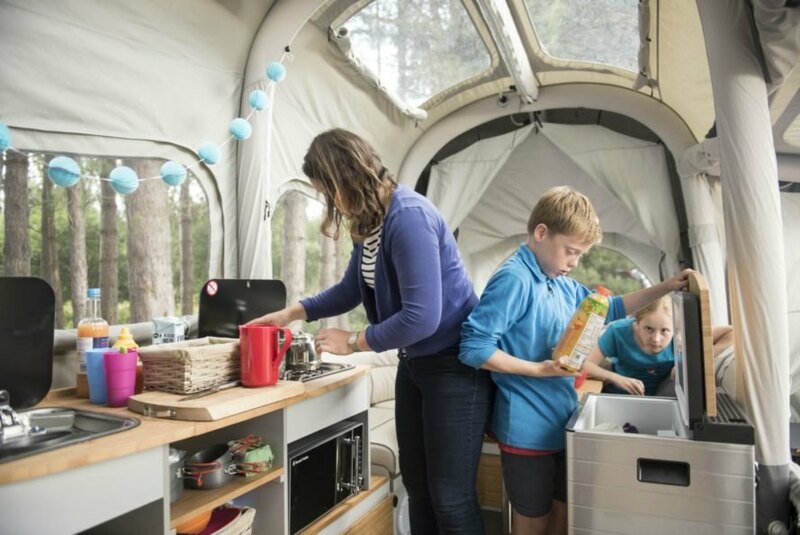 The Air Opus Camper makes on-the-road living easy with an amazing self-inflating system that pops up in 90 seconds flat. Simply flick a switch and the camper automatically expands. When it’s time to leave, a quick-release valves deflate the camper in 30 seconds. The entire structure can be folded up and ready to go in under two minutes. The Air Opus Camper uses Air Pole Technology to make set up a snap. To inflate the camper, the two lids on top of the trailer need to be folded outwards. Once completely extended, there are just a few bed supports to snap into place. The final step is engaging the air pump, which inflates the camper in a minute and a half. 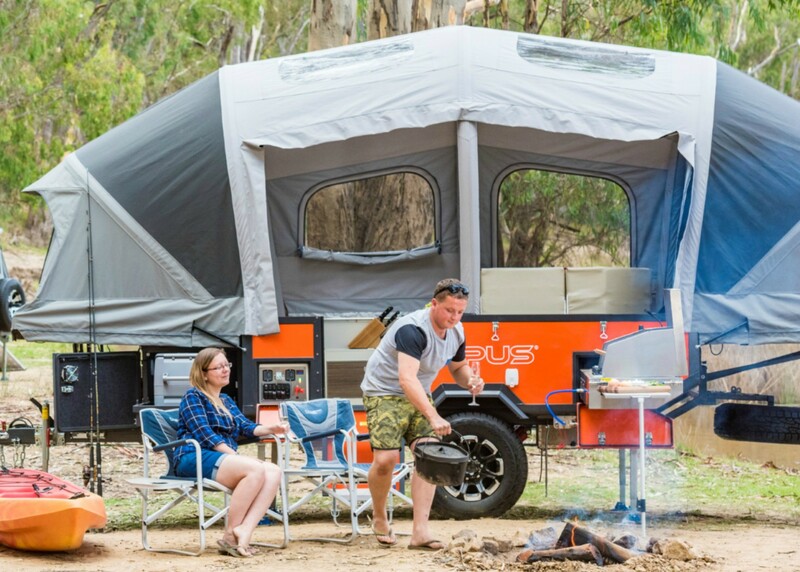 The Air Opus camper, which retails at $21,499, offers an exceptionally comfortable interior with plenty sleeping and living space. The design improves upon previous models with more windows and skylights to let in natural light. As an extra bonus, the trailer is outfitted with a nifty pull out kitchen/grill for outdoor bbq-ing around the campfire. This will be fantastic when the air bladders develop a leak. I'm sure replacements will be available everywhere in 5 years when you need them. What's wrong with shoving in collapsible poles? Using Air Pole Technology, the camper setup is easier and faster than ever. To inflate the interior of the innovative camper, the two lids on top of the trailer need to be folded outwards. Once completely extended, there are just a few bed supports to snap into place. The final step is engaging the air pump, which inflates the camper in a minute and a half. When its time to pack up, a quick-release valves deflate the camper in 30 seconds. The entire structure can be folded up and ready to go in under two minutes. 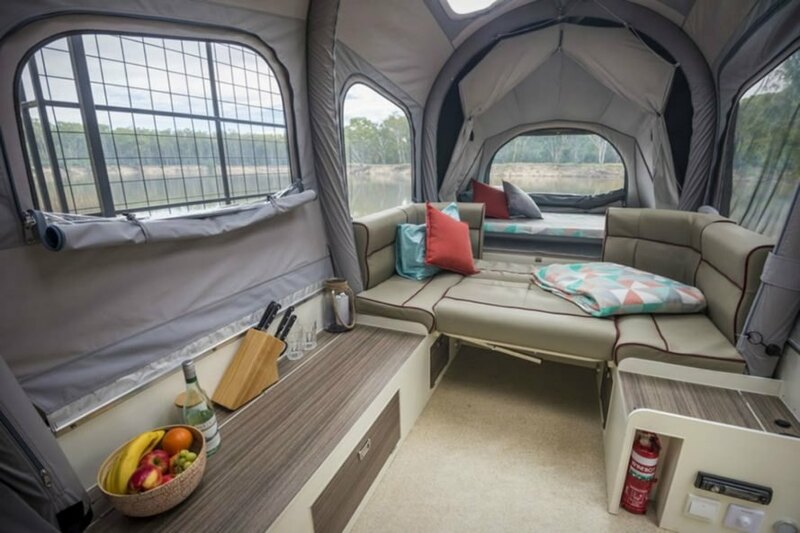 Related: TAXA unveils ultra-lightweight Mantis camper with pop-up roof The Opus camper not only offers easy setup, the six-berth camper interior space offers optimal comfort as well. The Opus design is known for creating spacious living areas, but with the Air Opus, the interiors have more space than ever. Additionally, the newer models have more windows and skylights to let in natural light. As an extra bonus, the trailer is outfitted with a nifty pull out kitchen/grill for outdoor bbq-ing around the campfire. Using Air Pole Technology, the camper setup is easier and faster than ever. To inflate the interior of the innovative camper, the two lids on top of the trailer need to be folded outwards. Once completely extended, there are just a few bed supports to snap into place. The final step is engaging the air pump, which inflates the camper in a minute and a half. The Opus camper not only offers easy setup, the six-berth camper interior space offers optimal comfort as well. Air Opus Pop-Up Camper is the ideal off-grid camper. The Opus design is known for creating spacious living areas, but with the Air Opus, the interiors have more space than ever. The camper comes with a pull out grill. The interior living space in incredibly spacious. When its time to pack up, a quick-release valves deflate the camper in 30 seconds. The entire structure can be folded up and ready to go in under two minutes. The interior room in the Air Opus is incredibly spacious. 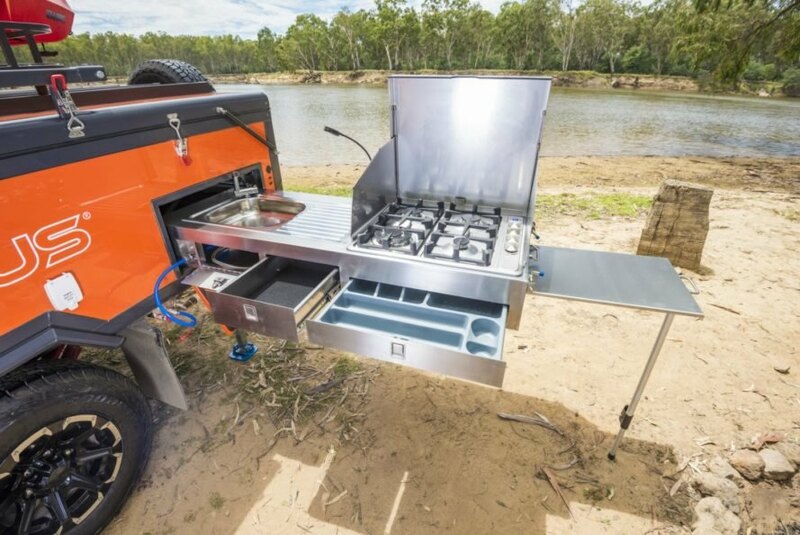 As an extra bonus, the trailer is outfitted with a nifty pull out kitchen/grill for outdoor bbq-ing around the campfire. The Opus campers have more windows and skylights to let in natural light. 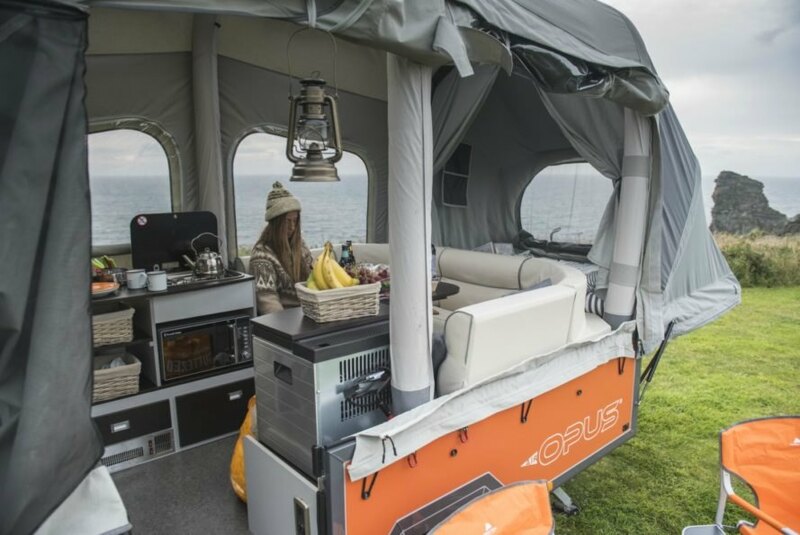 Air Opus Pop-Up Camper has a self-inflating tent top.